Memorial Day to me isn’t about war or all the feelings that go along with it. It’s about individuals who chose to serve in the United States Military, they chose to possibly make the ultimate sacrifice. Chances are there is a veterans’ cemetery where you live, or several of them. You’ll find many soldiers buried there who returned from the war and lived full, productive lives. But you’ll no doubt find a bunch of headstones that tell the story of an abbreviated life. Each of those markers represents the crushed dream of a wife, a parent, a brother, a sister. I hope we will remember that on Monday, in between hanging out with family and firing up the grill and hanging out with friends, if even for a fleeting moment, you realize that this is not just a day off from work or school. Our fallen heroes chose to put their lives on the line for many reasons, and I’m certain that giving us a day-off is not one of them. Right now the U.S. has 1,473,900 men and women on active duty. Nearly 10,000 are in Afghanistan and Iraq. That means on Monday, as you celebrate your “day off work” with family and friends, 10,000 soldiers will not be taking the day off, nor be with the ones they love. They will be putting their lives in danger for our freedom. OUR freedom! So thank you to the men and women we honor this Memorial Day! Thank you to all those who have served this nation from its founding 239 years ago. 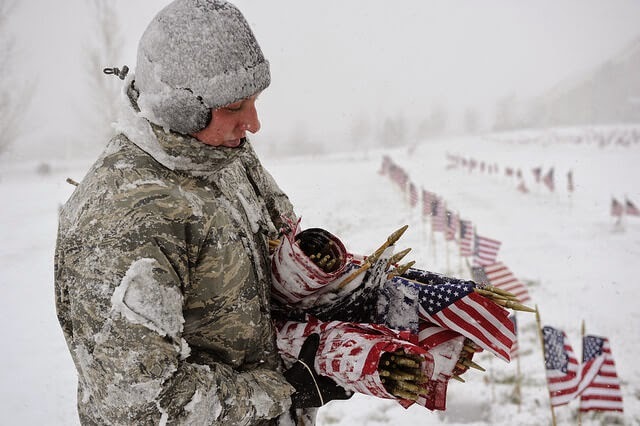 Since the Revolutionary War, we have lost 1,010,485 men and women in combat. They paid the ultimate price. For that, we are forever indebted to remember them not just on Memorial Day, but the other 364 days of the year as well.